Creutzfeldt-Jakob disease (CJD) is clinically characterized by progressive dementia and neuropathologically characterized by deposits of a protease-resistant isoform of the prion protein (PrPres) in the central nervous system. PrPres deposits in the neural retina were identified in the outer and inner plexiform layers (OPL and IPL) in a limited number of sporadic Creutzfeldt-Jakob diseases (sCJD) and two variant CJDs [1, 2]. However, the presence of PrPres in the neural retina remains unknown in other types of CJDs. Therefore, we analyzed 16 prion cases from our brain bank, including sporadic, familial, and iatrogenic CJDs by using retinal sections . At the time of autopsy, full permission was obtained from each patient’s next-of-kin. The posterior portion of the eye ball was removed with a scalpel, leaving the cornea and lens for funereal purposes. The following cases were available: nine cases of sCJD (MM1), two cases of sCJD (MM1 + 2, MM1 > 2), one case of sCJD (MM2), three cases of familial CJD (fCJD) (two of V180I and one of M232R), and one case of iatrogenic CJD (cadaveric dura mater graft, dCJD). We classified sCJDs based on the Parchi’s methodology [4, 5]. We also used four autopsy-confirmed neurological cases as controls (Table 1). For immunohistochemical studies to detect PrPres, formalin-fixed and formic acid-treated sections of the retina were immunolabeled with monoclonal antibodies specific to prion proteins 3F4 (109–112) (1:200, Biolegend, USA) and 12F10 (142–160) (1200, Bertin Bioreagent, France). The retinal sections were processed by using a Ventana Discovery automated immunostainer. Evaluations of 3F4 and 12F10-immunoreactive deposits (PrPres-irs) of the outer and inner plexiform layers were performed by using both antibodies in a semiquantitative manner: 0 = none, 1 = positive and scattered, 2 = positive (Table 1). PrPres-irs staining was weak or focal in the outer and inner nuclear layers (ONL and INL), as well as in the ganglion cell and nerve fiber layers (GCL and NFL); thus, we calculated the frequency of cases with PrPres-irs staining, separated on the basis of each anatomical region of the neural retina. In all CJD cases, 3F4 and 12F10-irs were consistently and clearly observed in the OPL and IPL of the neural retina (Fig. 1a). In our series, 12F10-irs staining was stronger than 3F4-irs. PrPres-irs staining exhibited granular and fine synaptic patterns in the OPL and IPL, respectively. Although PrPres-irs staining was always present in both OPL and IPL, PrPres-irs staining was stronger in sCJD (MM2), fCJD, and dCJD cases than in sCJD (MM1) cases (Fig. 1a). In some instances, fine-dot PrPres-irs staining was observed in the INL, ONL, GCL and NFL. More consistent findings were observed in sCJD (MM2), fCJD, and dCJD cases (Fig. 1b). No PrPres-irs staining was present in the photoreceptor cell layer. In addition, there was no amyloid-beta (4G8), p-tau (AT8), p-synuclein, or TDP-43-irs staining in the retina. No PrPres-irs staining was observed in retinas from control cases. There was no clear PrPres-irs staining in the optic nerves. Clinical characteristics, such as age at onset, duration, gender, and initial presentation were not associated with the presence or absence of PrPres-irs in the retina. Our methodology analyzing the posterior portion of the eye ball accurately reflected the pathologic condition of the neural retina in prion diseases. Indeed, a previous study showed that PrPres-irs were not prominent in the anterior portion of the neural retina . Our study is the first to describe PrPres-irs within the retina in a series of cases of sCJD (MM1), sCJD (MM2, MM1 + 2), fCJD, and dCJD. Although we did not quantitatively evaluate the amount of PrPres in each case, PrPres-irs in the OPL and IPL may be more prominent in fCJD and dCJD cases. In addition, PrPres-irs were occasionally observed within layers of neural retina other than the OPL and IPL. Protease-sensitive normal cellular PrP was identified in the neural retina of healthy controls . Because no 3F4-irs and 12F10-irs were present in control cases, we suspect that 3F4-irs and 12F10-irs in the retina of the present cases reflect PrPres accumulation. Head et al. 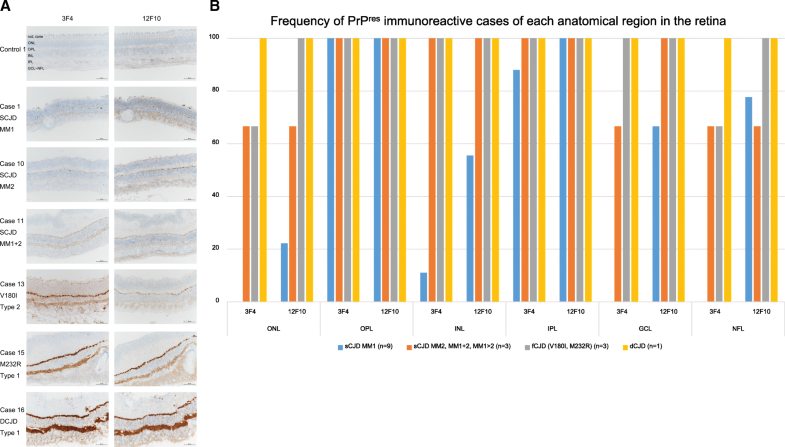 performed a detailed analysis of PrPres in the neural retina [1, 2]; they found that PrPres-irs were present in the OPL (granular pattern) and IPL (synaptic pattern) in one case of sCJD (MM1) and two cases of variant CJD. PrPres was reported as less detectable in the neural retina of sCJD (MM1) . Another study reported the presence of PrPres in the neural retina in vCJD, but not in sCJD, by Western blotting analysis . In Gerstmann–Sträussler–Scheinker disease (F198S), PrP deposits were found in the inner portion of the OPL . We suspect that the type of prion disease is associated with the pattern and severity of PrPres-irs in the neural retina. There was no clear association between the clinical duration and PrPres-irs in the neural retina. The present study has some limitations. The sample sizes were small, except for cases of sCJD (MM1). This study was able to describe PrPres staining in the OPL and IPL; thus, PrPres must be analyzed in other layers of the retina with another methodology, such as laser micro-dissection or biochemical analysis, because PrPres-irs staining in other layers was very weak. In the future, specific eye examinations may become a potential biomarker for the clinical diagnosis of prion diseases, similar to potential clinical diagnosis of AD by detection of amyloid-beta deposits in the retina . In terms of infection protection, we need to understand PrPres accumulation in the neural retina is common findings even in atypical clinical form of sCJD (MM2, MM1 + 2) as well as fCJD and dCJD. We are deeply grateful to all the study individuals and their relatives. We thank Mitsutoshi Tano and Shoken Aizawa for technical support. We thank Ryan Chastain-Gross, Ph.D., from Edanz Group (www.edanzediting.com/ac) for editing a draft of this manuscript. This study was supported in part by JSPS KAKENHI Grant Number 18 K06506, 16H06277, and Research Committee of Prion Disease and Slow Virus Infection, Research on Policy Planning and Evaluation for Rare and Intractable Diseases, Health and Labour Sciences Research Grants, The Ministry of Health, Labour and Welfare, Japan. This study was supported in part by JSPS KAKENHI Grant Number 18 K06506, 16H06277, and Research Committee of Prion Disease and Slow Virus Infection, Research on Policy Planning and Evaluation for Rare and Intractable Diseases, Health and Labour Sciences Research Grants, The Ministry of Health, Labour and Welfare, Japan. MT: conceptualization, methodology, autopsy, investigation (neuropathological analysis), and writing of the manuscript; HK and BM: conceptualization of clinical study; TK: Genetic and biochemical analysis. All authors read and approved the final maniscript. All procedures performed in studies involving human participants were in accordance with the ethical standards of the institutional and/or national research committee and with the 1964 Helsinki declaration and its later amendments or comparable ethical standards. The study was approved by the intuitional review board of Mihara Memorial Hospital (084–02). We obtained written informed consent from the deceased relatives for autopsy and further neuropathological analysis, and all subjects were registered with our brain bank for future research. The brain bank was approved by the Ethics Committee of Mihara Memorial Hospital for neuropathological analysis (072–01, 078–01, 085–01). We obtained written informed consent from the deceased relatives for publication.